Thyme in ancient Greek means "spirit", "power". Indeed, this medicinal plant gives vitality, improves the tone of the whole body and helps to cure some serious diseases. - black or green tea. Tea with thyme, or thyme, is the traditional drink of some European and Asian countries, located in the South. This drink has a strong flavor, so for its preparation, only a couple of sprigs of fresh or a pinch of dried crushed thyme. Tea can be brewed directly in the Cup. Just pour a grass of boiling water and allow to stand for 5 min. Express option: take a pinch of thyme, pour 200 ml of water, boil for 1-2 min Remove from heat, strain and allow to cool slightly. If you want to fully enjoy the aroma and the ceremony of tea, use the teapot. Douse it with boiling water, put 1 tsp. of black tea and a couple of sprigs of thyme. Black tea can replace green. Pour the contents with boiling water without adding to the edge of 2-3 cm, Cover the kettle tight with a cloth and let stand for 5 minutes For the warming effect in cold dilute in the kettle or in a Cup 1 tsp of honey. Instead of welding you can use herbal teas. Take equal amounts of thyme, peppermint and St. John's wort, pour boiling water and insist under the lid for 10-15 min. Separately with thyme goes well rose. Put in a teapot a pinch of herbs, a bit of black tea (optional) 1 tsp of dried rose hips. Brew drink, as in previous methods. Pour the tea into the teacups and enjoy its taste and aroma. Drink thyme better in the morning – it helps me and gives me strength. Drink thyme is contraindicated in pregnant women and people with high blood pressure. To prevent trouble, consult your doctor. Tea with thyme helps to defeat the first cold symptoms, effective in diseases of the respiratory tract, stomach and intestines. 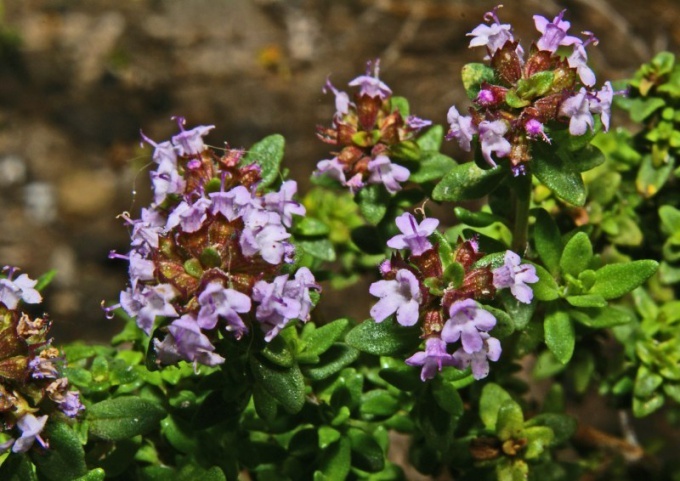 Drink thyme is useful for the prevention of male diseases.